Dan Patrick started his motorsports amateur career at the age of 17, competing with multiple engine tractor pulls at the local and state levels. In 1983, Dan began devoting all of his time to the pulling competitions in the modified tractor class, traveling the United States and Canada. In February of 1984, Dan participated in the first motorsports event in Madison Square Garden, New York, New York, driving KING CRAZY, the Pulling Funny Car. 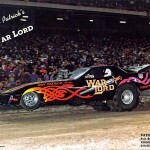 In 1985 Patrick’s modified two wheel drive Pulling Funny Car named “WARLORD”, became so well known that PLAYSKOOL TOY COMPANY built a replica of the car and featured it in a cartoon series called, SST MUSCLE MACHINES. Dan’s success was noticed by drag racing legend, Tom “The Mongoo$e” McEwen, who approached him about forming a partnership along with the COORS Brewery of Golden, Colorado. 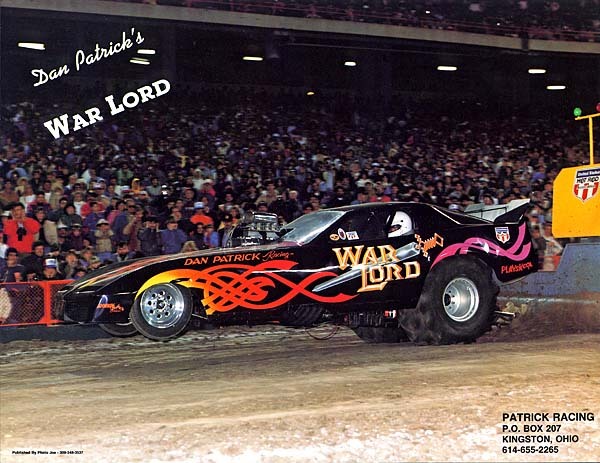 1986 and 1987 found Patrick campaigning two puller funny cars for COORS with great success, and in 1987 he built and introduced the first dragster style puller. 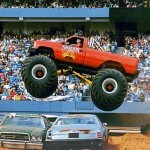 Dan extended his operation in 1988 by purchasing the very popular SAMSON® monster truck and joined United Sports of America’s MOTOR SPECTACULAR events as a monster truck competitor. From 1989-1992, Dan was contracted by Team Bigfoot to start and maintain a racing operation. Dan designed a new style chassis that provided a lightweight-racing vehicle along with superb durability. These new trucks became the wave of the future with over 70% of today’s monster trucks racing a similar design. Throughout this period, Dan traveled with his own monster truck and funny car puller with a continuing sponsorship from COORS Brewery, under the name of COORS EXTRA GOLD SAMSON®. Today, Dan continues his association with the Bigfoot organization by building chassis’s for the team and remains involved in other Bigfoot ventures. 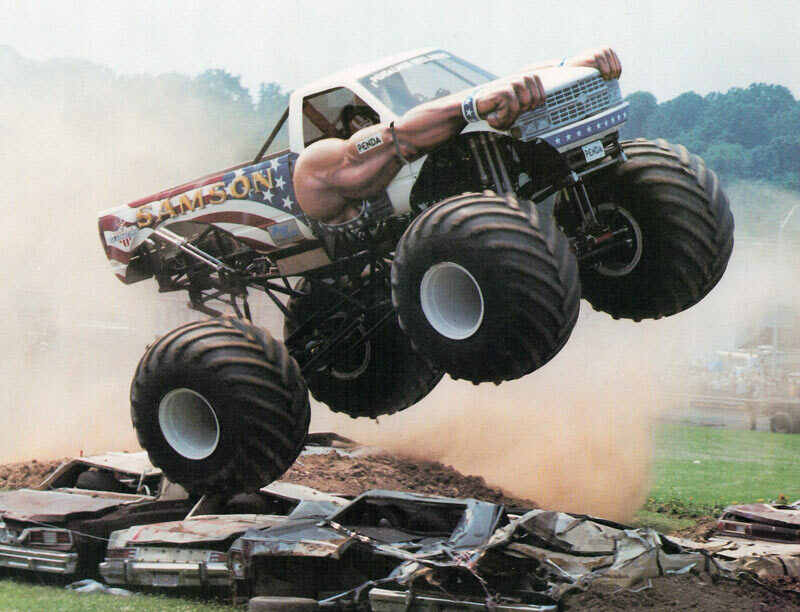 Dan was approached to build a monster truck around the hit television series, AMERICAN GLADIATORS. The all-new 3-D design SAMSON® muscle truck debuted in January of 1993 and has performed across the country gaining in popularity with every event. The 1994 season brought new opportunities for Dan to participate in the nationally televised PENDA POINT SERIES Monster Truck Competition. In his rookie season, Dan was the first monster truck ever to beat the magic 5-second mark with a run of 4.983 at the Bloomsburg, PA Summer 4-Wheel Jamboree Nationals. SAMSON® was also the first Chevrolet in the winner circle since the summer of 1992. 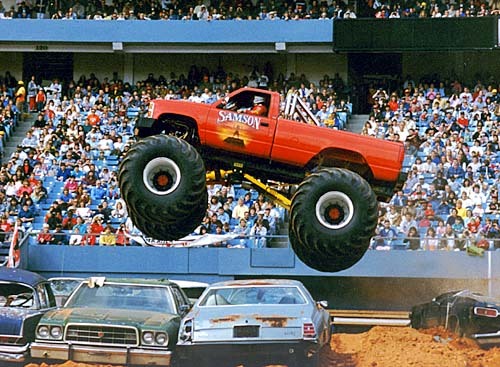 February of 1996, Dan Patrick’s monster truck SAMSON® was selected to represent monster truck racing at the grand opening of the world’s first motorsports theme restaurant, RACE ROCK CAFE in Orlando, Florida. The truck was on permanent display inside the restaurant from February 1996 until the closing of June 2007. 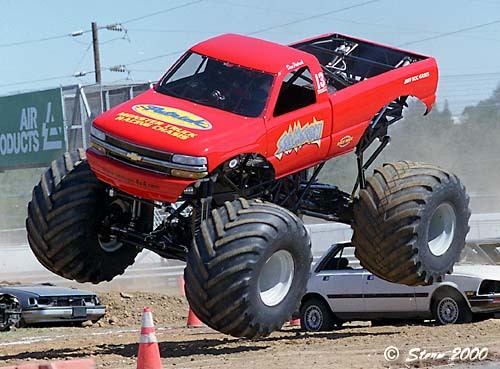 In the 1997 and 1998 seasons, Dan and the SAMSON® Monster Truck participated in the first prime time live television coverage of a Monster Truck Motorsports event called “Motor Madness”, which aired on The Nashville Network. The spring of 1998, Dan learned what it was like to have a camera on his every move! He was selected by a program called CBS Eye Witness “Eye On People” and was featured in a documentary on Monster Trucks and the alternative lifestyle associated with the business. A crew traveled with Dan from California to Ohio and covered several racing events as well as seeing his operation at home and meeting his family. 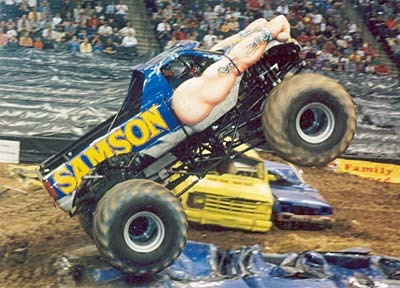 In December of 1999, Dan and SAMSON® were featured on a TV special on The Learning Channel called “The Secret World of Monster Trucks”. This was filmed at the Special Events 14th Annual 4 Wheel Drive & Off Road Jamboree in Lima, Ohio, May 1999. 2000, 2001 and 2002, Dan and SAMSON® participated in the new TRUXPO Truck Tour Monster Truck Racing Series, sanctioned by ProMT (Professional Monster Trucks) and promoted by ISC (International Speedway Corporation). This was the first series of its kind held exclusively at major motorsports facilities including Darlington Raceway, Talladega Superspeedway, Nazareth Speedway, Phoenix International Speedway, Kansas Speedway, Bristol Motor Speedway and Daytona International Speedway. This series was a points race with a field of 12 Monster Trucks. The ProMT/ISC races were exceptional and it was a great experience for the participants and spectators alike. 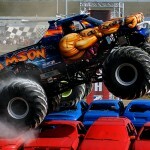 February of 2003, Dan and SAMSON® were featured on The Travel Channel in a new program called “Monster Truck Race Day”. The show documented the ProMT (Professional Monster Trucks) / ISC (International Speedway Corporation) points racing series, filmed April 2002 from NASCAR’s Daytona Superspeedway, where the trucks raced on the infield. April of 2003, Dan completed the construction of the Hot Wheels Display Monster Truck for Clear Channel Entertainment Motorsports for the Museum of Science & Industry in Chicago, Illinois. The exhibit, Monster Trucks – The Science of Extreme Machines is a one of a kind display of monster trucks, the history, experience and science behind building and driving them. Dan also contributed some SAMSON® memorabilia and interviews for the exhibit. This exhibit travels to museums across the United States. It is a great display and well worth your time!!! 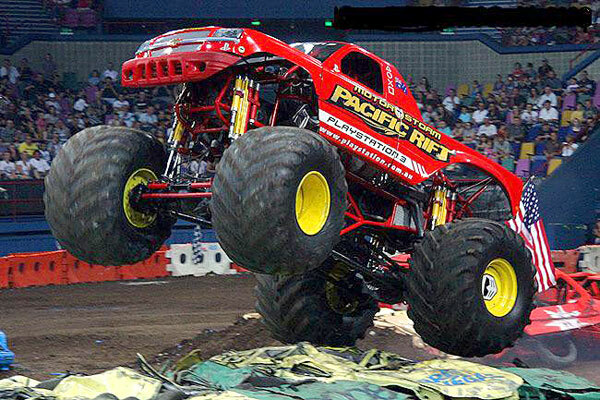 Dan Patrick & SAMSON® participated in the Monster Truck Challenge Points Championship Series in 2004 & 2005. The series features great competitive racing, awesome race courses and outstanding freestyle and proved to be great racing seasons. The series was promoted by Rich Schaefer. TOYS – TOYS – TOYS!! For the SAMSON® fans… (kids and adults as well!) There are many Remote Control, Die Cast Collectible, plastic and Pillow “puff truck” SAMSON® toys that have been produced and are available. There are also many books featuring SAMSON® that have been published as well. 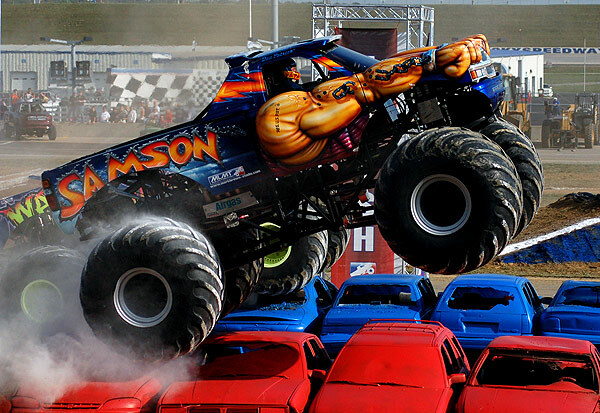 Patrick debuted the ‘New” SAMSON®/Hulk Monster Truck July 2005 in Radford, Virginia. The “Hulk” performed at several events in Virginia and Pennsylvania in July and August with much success! There were SAMSON®/Hulk Monster Truck Die Cast collectibles made at that time. In May of 2004 and again in January of 2011, the local affiliates of ABC and Fox News from Columbus, Ohio came to Dan’s shop for a news feature of his unusual occupation! The story not only related to the Monster Truck events around the country where he travels and performs, but also the fact that Dan builds the majority of the monster trucks for this industry. In February and July 2005, The Michael Hoff Production film crew from Emeryville, California came to Dan’s shop and home to interview and film for a new project about the Evolution of Monster Truck Racing for the National Geographic Channel. This informational program aired December 2005. 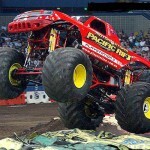 Dan Patrick & SAMSON® competed in the 2005 & 2006 Monsters of Destruction Monster Truck Series. Monsters of Destruction was the only true monster truck racing series featuring electronic timing equipment and had the best competition in monster trucks today. Monsters of Destruction consisted of 26 annual rounds of competition and featured Straight Line Drag Racing, Obstacle Course Racing and Monster Truck Freestyle. All rounds of competition were nationally televised on The Outdoor Channel. Milestone Motorsports, based out of Temecula, California, promoted the series. The Monsters of Destruction, Behind the Scenes cameras filmed at Patrick Enterprises shop, office & home in Circleville, Ohio February 2006. The show featured the history of Dan Patrick, the creation of Patrick Enterprises and the influence Dan Patrick/Patrick Enterprises has and continues to have on the entire industry. Monsters of Destruction – Behind the Scenes is a television series dedicated to a true inside look at the monster truck industry, the industry’s icons and the behind he scenes excitement at each round of MOD competition. MOD – Behind the Scenes is the only monster truck television series shot exclusively in High Definition. All MOD programming is exclusively on The Outdoor Channel. MOD television air times and show descriptions will be posted on www.monstersofdestruction.com. 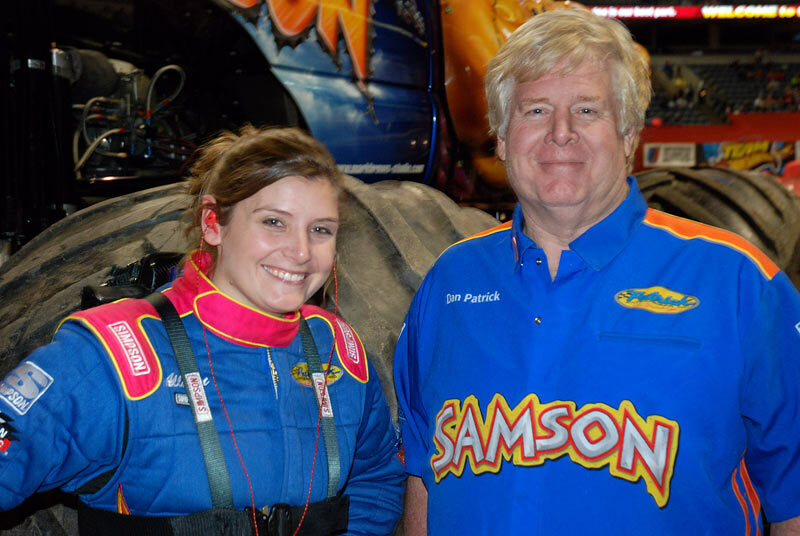 Dan Patrick & SAMSON® participated and finished third in the Major League of Monster Trucks racing series in 2007. The races were held at Speedways and Motorsports Parks across the United States. The season started at Lowes Motor Speedway, Charlotte, North Carolina in August and continued through September and October from Las Vegas Motor Speedway, Red Bluff, California, Kentucky Speedway, Memphis Motorsports Park and finished at Nashville Superspeedway. In 2008, the Major League of Monster Trucks presented a championship series at some of the finest motorsports facilities in the nation. The series was a points race with a field of at least 16 Monster Trucks. The new series hoped to bring Monster Truck racing to mainstream audiences in a legitimate form of competition. The MLMT event in Nashville, TN on Oct. 27, 2007 was the last racing appearance for the current Samson Monster Truck. The truck (without the current body) was sold to the Fun Spot Action Park in Orlando, Florida and will be on permanent display along side the Bigfoot truck that was purchased from Race Rock in June. The Samson truck with the Red-White-Blue body will be identical to the one that was on display inside the Race Rock Restaurant in Orlando. The truck was in place at the park December 2007. After 14 years of racing Samson (Patrick Chassis # 13), Dan built a new chassis for himself in the winter of 2007, and debuted the new truck January 11 and 12, 2008 at the Big Sandy Superstore Arena in Huntington, WV at George Eisenhart’s Monster Nationals event. Dan took home the racing win for the first run of the season! 2008 will mark Dan’s 20th Anniversary of monster truck racing with Samson. Also, in 2008, Dan participated in the Monster Truck Challenge monster truck racing series. The events were new to Raceway Park Shakopee in Shakopee, MN, El Dora Speedway in Rossburg, Ohio, Myrtle Beach Speedway, Gateway International Raceway in Madison, IL, and returned to the Dirt Track at Lowes Motor Speedway and Nashville Superspeedway. The tracks were phenomenal and the racing was great!!!! Dan is currently the reigning 2008, 2009 and 2010 South Pacific World Finals II Monsters of Destruction racing Champion. He competed in 2008, 2009 and 2010 in Brisbane and Sydney, Australia against Australian and USA drivers for this title. In 2009, Dan completed in the SAMSON® monster truck that he built and shipped to Australia. This was the first event for the new truck. He looks forward to returning to Australia in the future. Besides traveling, Dan owns and operates a machine shop and chassis & component business. 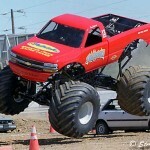 His chassis’s have become known as the “Patrick Chassis” within the Monster Truck Racing sport. He has built 100+ chassis’s for his competitors, and services approximately 60% of all competing monster trucks worldwide. Dan also has built and shipped complete race ready monster trucks to Finland, UK and Australia. Overall, Patrick has had 25 years experience in Monster Truck Racing and 16 years experience in Truck & Tractor Pulling. Dan travels with SAMSON® to an average of 30 to 35 events per year, which are approximately 80 shows. The unique design of the SAMSON® truck and Dan’s custom built transporter, equipped with living quarters, hospitality lounge, and a repair shop are easily recognized by fans and stand out from the competition. Dan’s professionalism and first class operation has earned him a loyal following of fans and great respect from his peers through the years. Patrick has been married for 36 years to Chris and has two daughters, Natalie, 33 and Allison, 29. In 2010, Dan and Chris celebrated 25 years with their business, Patrick Enterprises, Inc. and in 2011 have moved into their new facility. Also in 2011, Dan and Chris announced that their youngest daughter, Allison 26, would be the new driver of Samson. 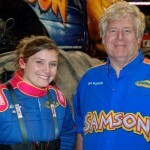 Dan will still be piloting Samson at some events, but eventually Allison will become the full time driver. She made her debut January 18, 2013 at the Monster Jam event located in the BMO Harris Bradley Center in Milwaukee, WI the Monster Jam! We all look forward to this exciting new venture!! 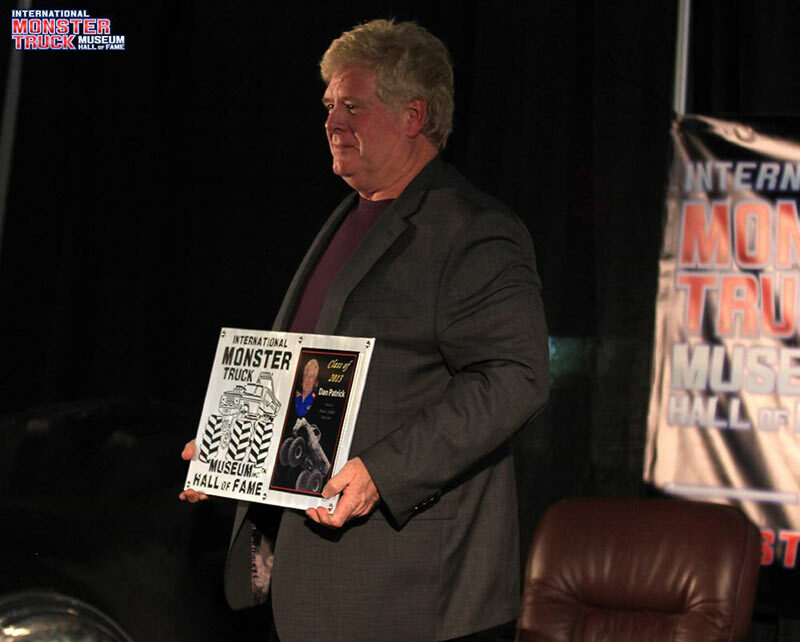 Dan was very honored to be inducted into the 3rd class of the International Monster Truck Museum and Hall of Fame for 2013. The reunion and ceremony was held at the Dean V. Kruse Museum in Auburn, IN November 8th and 9th, 2013. Dan was chosen and recognized as a Driver, Builder and Innovator for his contributions in the Monster Truck sport and industry in the past 25 years. In 2013 Dan will be heading into this 25th year of owning and driving SAMSON®. “This business has been good to me and my family and we look forward to another 25 years”! !